It's that stage of the Summer where my recipe selections often hinge on the amount of heat that will be created in my kitchen. As I'm typing this at 4:00 in the afternoon, it's 98 degrees out. Uggh. So, Chicken Satay Noodle Salad was a perfect choice for us this week, since it utilizes rotisserie chicken. The only thing that will heat up your kitchen with this recipe is the boiling water for the noodles. 1. Bring a large pot of water to a boil, salt it, add the pasta and cook until al dente. Drain; rinse under cold water and set aside. 2. While the pasta is working, in a large bowl, whisk together the peanut butter, honey and 1/4 cup warm water. Whisk in the tamari, lime juice, hot pepper sauce and garlic. Pour in the oil in a steady stream, whisking to combine. Add the reserved noodles and toss to coat. 3. 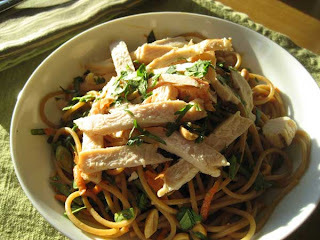 Place the noodles in 4 shallow bowls and top with the chicken, spinach, carrots, scallions, peanuts and cilantro. Bookmarked! I'm definitely going to be making this. Have you tried the Italian whole wheat spaghetti from Costco? I'm loving it. We only recently got a Costco membership so I will have to find it! You're forcing me to make these noodles this week! I can't resist. I do love the whole wheat pastas, my favorite is actually a whole grain made by Heartland. Barilla also has a good one. Some of the pastas are really thick and sit on my stomache like a lead brick. I've got your ingredients on my grocery list, and I'm definitely making this soon! That salad looks totally like something I'd enjoy! Marking it to try next time I have either roasted chicken leftover or a rotisserie chicken... yum! I made this for the first time in May, and it's delish!! I took it to bunco last night, and the girls loved it.